The situation is a lot more complex than the honourable Lady makes out. First and foremost, anyone who does not meet the financial criteria has a waiver and can go to court. Secondly, there have been a lot of pre-determinations by Acas. Employment is going up and there are fewer applications. There are a lot of factors and she does herself no credit by simplifying matters. In this post I’m going to focus on the hapless junior minister’s reference to what he calls ‘a waiver’, but which most of us know as fee remission. I want to make it very clear that for those with a genuine claim, fees will not be a barrier to justice. We will ensure that there is a remissions system for those who need help. It is important to emphasise that the Government have been very careful to ensure that fee waivers are available for those people of limited means in order that they are not excluded from seeking redress through tribunals. Unfortunately, anecdotal evidence from employment law practitioners, and the very limited amount of statistical data released by Mr Vara’s Ministry of Injustice to date, indicates that fee remission has done very little indeed to protect the access to justice of “those of limited means” since July 2013. As described elsewhere on this blog, until this week pretty much the only published data was that on grants of remission set out in the Ministry’s partial reply in October last year to a parliamentary question by shadow business secretary Chuka Umunna. Together with a bit more information on grants of remission included in the written evidence of a Ministry official in defence of UNISON’s second application for judicial review of the fees regime, that PQ reply told us that just 1,946 (10.4 per cent) of all 18,660 single claimants in the 11-month period 29 July 2013 to 30 June 2014 obtained some remission (full or partial) in relation to their case. However, this week, in reply to a further parliamentary question by shadow BIS minister Ian Murray, the Ministry provided figures on grants of remission for July to December 2014. This tells us that there were 3,459 remission grants to single claimants in that period. However, we know from the breakdown given in the Ministry official’s evidence to the High Court that some 10 per cent of those grants will have been in relation to the appeal fee. And as a claimant granted remission for the appeal fee is also very likely to have received remission for the issue fee, those grants are double-counted. So we need to reduce the figure of 3,459 by 10 per cent, to 3,113. (Yes, the ’10 per cent’ may have gone up or down in recent months but, as there’s no way of telling from the Ministry’s reply, let’s just run with it). I imagine Mr Vara would want us to dwell on the fact that, applying this 10 per cent reduction to the most recent quarter for which both the ET claim and remission grant figures are available – July to September 2014 – about 1,400 (33 per cent) of the 4,252 single claimants obtained full or partial fee remission. Which is a lot more respectable than the 10.4 per cent figure above. To my mind, there are three possible explanations of this increased respectability: the number of remission applications has increased in recent months; or the Ministry’s decision-making has become less severe in recent months; or the extent of double-counting of claimants granted remission in respect of both the issue and the appeal fee has increased in recent months. Indeed, we do know that the Ministry relaxed the evidence requirements for fee remission applications at the end of June 2014, and we can expect that to have increased the success rate, even if only slightly. And I would’t be surprised if the extent of double-counting has increased, but we won’t know until the Ministry provides a breakdown of remission grants to single claimants by issue fee and hearing fee. Unfortunately, we also have no idea how many applications for fee remission were made, and how many were refused, in any of these time periods, because the Ministry of Injustice paid some £2m for a new ‘ET fees & remission’ database that, thanks to a lack of functional reporting tools, has yet to produce any reliable data, almost 18 months after it went live on 29 July 2013. (The above figures on remission grants are taken from a separate, finance system database). It seems we have to wait at least until publication of the next set of quarterly tribunal statistics, in early March, for the first figures on fee remission applications, grants, and refusals from that database. Whatever, the latest figures on remission grants are more meaningfully judged not against the actual number of claims in that period, but against the number of claims we might have expected to see, had fees not been introduced in July 2013. In my previous post on the other parts of Mr Vara’s reply to Diana Johnson, I set out two alternative (but ultimately very similar) projections for the number of single claims we might have expected to see in 2013/14. Applying the most recent remission grant figures (for the six months July to December 2014) to the average of those two projections, we get a figure of 12.4 per cent of the single claimants we might have expected over a full year obtaining remission in relation to their case. Which is not so respectable, and certainly still well below the 31 per cent that the Ministry predicted in late 2013, in its final impact assessment of the (revised) remission scheme. So, as with the rest of Mr Vara’s reply to Diana Johnson, the Parliamentary Under-Secretary of State for Justice does himself no credit by claiming that “anyone who [meets] the financial criteria has a waiver and can go to court”. The fee remission scheme appears to be protecting access to justice for only one in eight of the workers we could expect to be issuing a (single) tribunal claim, had fees not been introduced. Which is entirely to be expected, given the complexity and narrowness of the eligibility criteria – the fee remission application form and explanatory notes run to 30 pages. Perhaps most significantly, any claimant in a household which has been prudent enough to build up modest savings of £3,000 or more will not qualify for any remission. So much for all those ministerial speeches about the need for people to take personal responsibility and put money aside for rainy days. If you and your partner have saved up £4,000 to help with the cost of the baby you’re soon to have, and then your employer unlawfully selects you for redundancy because you are pregnant, you’re probably not going to risk £1,200 of those precious savings pursuing a tribunal claim. Finally, if you’re wondering why I haven’t included a nice little graph charting the number of remission grants in each month from July 2013 to December 2014, it’s because the figures for July to December given by the Ministry in its reply to Ian Murray are not compatible with the figures for the 11 months up to June 2014 given by the Ministry in its reply of 15 October to Chuka Umunna. The former include grants in multiple claimant cases (just 31 in six months), whereas the latter include all the claimants in multiple claimant cases (1,530 in 11 months), though we only know this from the Ministry official’s evidence to the High Court. Diana Johnson: Since the Government introduced employment tribunal fees, there has been a drop of 84 per cent in the number of women who have been able to bring discrimination claims. Does the Minister accept that, because of the up-front fees of £1,200, many women are being denied justice under his Government? Shailesh Vara: The situation is a lot more complex than the honourable Lady makes out. First and foremost, anyone who does not meet the financial criteria has a waiver and can go to court. Secondly, there have been a lot of pre-determinations by Acas. Employment is going up and there are fewer applications. There are a lot of factors and she does herself no credit by simplifying matters. We might ask just how much credit the PUSS for Justice does himself by wrongly referring to fee remission as ‘a waiver’, to the tribunal as the ‘court’, to Acas early conciliation as ‘pre-determination by Acas’, and to claims/cases as ‘applications’. But that would be harsh. Since joining the Ministry on 7 October 2013, Mr Vara has had only 15 months in which to master his complex brief. And he’s only a solicitor. So, let’s just concentrate on the “lot of factors” that make the situation so complex. 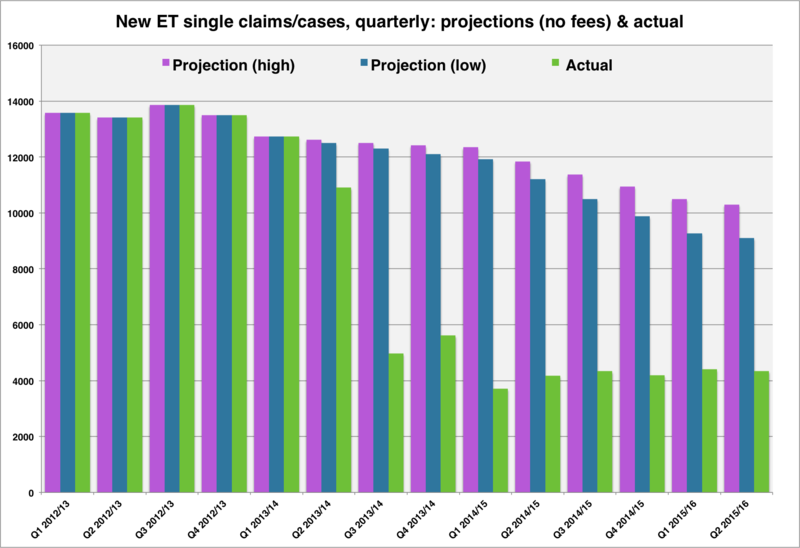 But before we do so, let’s remind ourselves of the situation, which is that, immediately following the introduction of fees on 29 July 2013, the number of new ET cases (single claims/cases + multiple claimant cases) fell off a cliff, and in recent months has settled at about one-third of the pre-fees level. Here’s a chart with which you may be familiar (so, to keep your interest going to the next paragraph, I’ve changed both the colours and the chart style). So, what might be the “lot of factors” explaining the fall in ET case numbers shown in this chart? 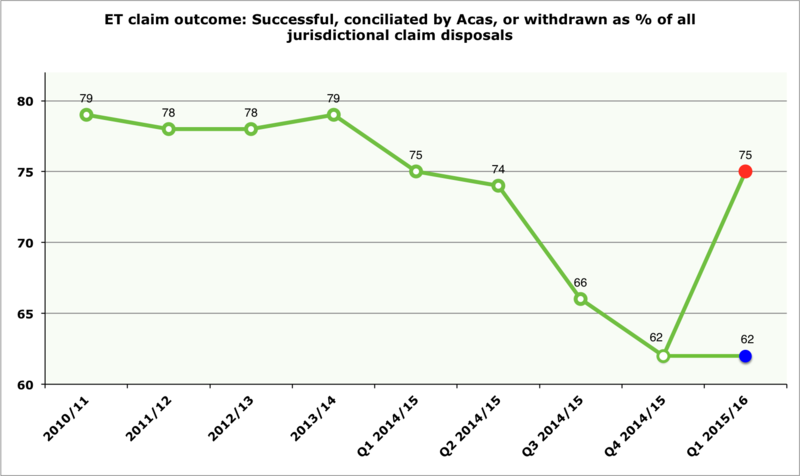 It is indeed true that a system of early conciliation of potential ET claims by Acas came into force on 6 April 2014. And, as that system was intended to reduce the number of ET claims/cases, it is fair to say that the picture does get a bit complicated from 6 April 2014 onwards. So, let’s just ignore the ‘new case’ figures for the months April to September 2014. That way, we can dispense with Mr Vara’s Possible Factor #1 entirely. And, whilst we’re at it, let’s ignore the three months July to September 2013, which saw a big spike in July as claimants and claimant representatives lodged claims earlier than they would have done in order to beat the introduction of fees, followed by a compensatory cliff-like drop in August and September. Such an atypical period does not really help us with explaining the shape of the chart above. That leaves us with the six-month period 1 October 2013 to 31 March 2014, otherwise known as Q3 and Q4 of 2013-14, to compare with earlier periods. 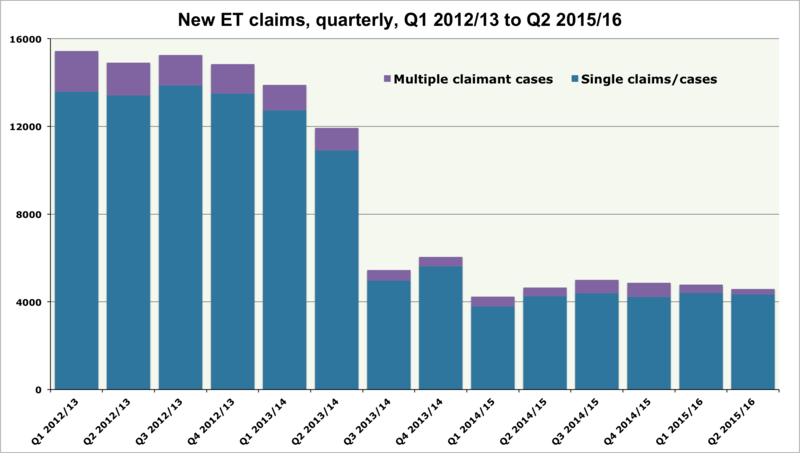 And, as the number of multiple claimant cases is relatively very small, let’s also focus on single claims/cases. As noted elsewhere on this blog, this is in any case the measure of ET claims favoured by the Ministry of Injustice itself in the High Court, in the two unsuccessful applications for judicial review of the fees regime brought by trade union UNISON. What Mr Vara was trying to say here, I think, is that the economy has been picking up in recent years, so the number of ET claims/cases was already in decline before the introduction of fees. And it’s certainly true that the number tends to rise during times of economic crisis, and decline when the economy is doing better. So this is a thesis not as patently daft as Mr Vara’s ‘pre-determination by Acas’. Now, unemployment has been declining since October 2011, when it peaked at 2.7 million. So we might expect the number of ET cases to have been declining from about the same time. And – lo! – that is indeed what we find when we chart the annual number of ET single claims/cases. From this chart we can see that, having peaked in 2009-10 at the height of the economic turmoil and wave of redundancies that followed the global financial crisis of 2008, the number of ET single claims/cases declined slowly but steadily from 2010-11. By 2012-13 – the last full year before the introduction of fees – the number of single claims/cases was pretty much back to its pre-recession level. And it is at this point that we should pause to admire the masterful comic irony of Mr Vara’s Possible Factor #2. In fact, even as Dr Cable uttered those words, the number of ET single claims/cases was going down, and it continued to decline as the Ministry of Injustice finalised and then implemented its fees regime in July 2013. And now that decline is used by Mr Vara and others to haughtily dismiss concern about the impact of the fees regime on access to justice. Yes, I’m lovin’ that irony. But back to the chart above. 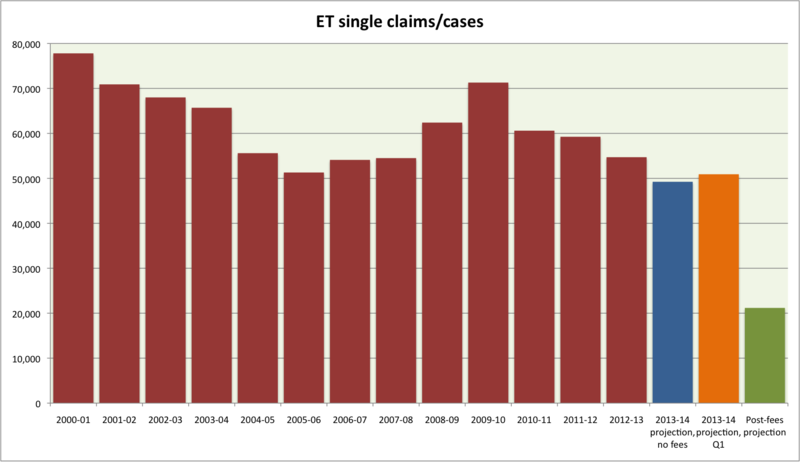 In 2012-13, the number of single claims/cases was down 7.7 per cent on 2011-12. Clearly, we don’t know how many such claims/cases there would have been in 2013-14, had fees not been introduced one-third of the way through the financial year, but the blue column in the chart is a projection based on a further decline of 10 per cent on 2012-13. That would have brought the number of single claims/cases to its lowest level this century. So much for the “danger” imagined by Dr Cable in 2011: ministers could have ‘achieved’ a record low in ET case numbers without even going into the office. And, if you don’t feel comfortable with me plucking a 10 per cent decline in case numbers out of thin air, the orange column is a projection for 2013-14 based on Quarter 1 of that year (April to June 2013). This still sneaks under 2005-06 to set a record low this century, despite equating to just a 6.9 per cent decline on 2012-13. The final, green column is a projection based on the six-month period 1 October 2013 to 31 March 2014, scaled up to 12 months. Is it credible that the slow rate of decline evident in the red (and blue or orange) columns, which certainly appears to fit with Mr Vara’s Possible Factor #2, suddenly accelerated – just as fees were introduced in mid-2013 – so as to reduce the number of single claims/cases to a level less than half that in every other year this century? To put it another way, does the PUSS for Justice do himself any credit by suggesting that the rate of decline in ET case numbers due to the slowly recovering economy increased from 2.3 per cent in 2011-12, to 7.7 per cent in 2012-13, then leapt to 61.3 per cent in the months immediately following the introduction of fees? Despite no corresponding great change in the rate of fall in unemployment? I do not think he does. I suggest that Mr Vara would do himself more credit by accepting that the recovering economy is no more than a relatively minor factor in the dramatic fall in ET case numbers since July 2013, most likely accounting for less than one-tenth of the drop-off. And on we go to Mr Vara’s Possible Factor #3 and the other nine-tenths of the fall in ET case numbers since the introduction of fees. Possible Factor #3: Er …. Oh. Mr Vara didn’t say what Possible Factor #3 is. Let alone Possible Factors #4, #5 and #6. He just left Diana Johnson, the rest of the House of Commons, and us dangling with the suggestion that there are “lots” of Possible Factors. So, what might these other Possible Factors that Mr Vara chose not to mention be? Mr Vara might well have said this, had he bothered to suggest to Ms Johnson that the introduction of tribunal fees has displaced some claims/cases to the County Court, where the claimant fees are (currently) somewhat lower. Unfortunately, the official County Court statistics are so primitive that, short of someone conducting some in-depth research, there is no obvious way of knowing for sure how significant this displacement factor might be. But some people – not least the former President of the Employment Tribunals, David Latham – believe there has been at least some displacement due to fees. However, we can at least estimate the maximum possible influence of such displacement on overall case numbers, because only a few types of tribunal claim can be brought in the County Court. In fact, of the 20 main jurisdictions identified by the Ministry of Injustice in its tribunal statistics, just four can be brought in the County Court: breach of contract; unlawful deductions from wages (UDW); equal pay; and breach of the national minimum wage. (The ever helpful Michael Reed of the Free Representation Unit advises me that, technically, a UDW claim cannot be brought in the County Court but, in practice, almost all such claims can instead be brought in the County Court as a breach of contract claim). The Ministry’s tribunal statistics tell us that, in 2012-13, these four transferrable jurisdictions accounted for 32.3 per cent of all ET jurisdictional claims. (Note that here we are back not just to all claims, including all those in multiple claimant cases, but to all jurisdictional claims, of which there were 332,859 in 2012-13, due to each claim including an average of 1.7 jurisdictions). So, even if every such claim/case had been displaced to the County Court by fees, that would still only account for about one-third of the overall fall in ET case numbers. Now 32.3 per cent is not an insignificant proportion – equal pay and unlawful deductions from wages are two of the most commonly claimed jurisdictions. But it is very unlikely indeed that anywhere near all of those jurisdictional claims would disappear off to the County Court, not least because many are brought in conjunction with other jurisdictional claims – such as unfair dismissal, and discrimination – that can only be brought in the tribunal. And, indeed, the Ministry’s tribunal statistics show that, in our six-month period October 2013 to March 2014, the four transferrable jurisdictions accounted for 29.8 per cent of all 48,283 jurisdictional claims. (We can even extend our period to September 2014, because the impact of Acas early conciliation is largely irrelevant here, and then we get a figure of 33.6 per cent). Were a significant number of tribunal claims/cases disappearing off to the County Court to take advantage of the lower claimant fees there, we could expect the proportion of all jurisdictional claims accounted for by the four transferrable jurisdictions to have headed down towards zero. So, whilst the fact that it has remained constant does not prove that tribunal claims/cases are not being displaced to the County Court in significant numbers, it certainly doesn’t help anyone – such as a PUSS for Justice – wanting to suggest that such displacement is a significant factor in the dramatic fall in ET case numbers from July 2013 onwards. Again, Mr Vara didn’t say this. But he might have done, because it’s a line of argument that’s been trotted out by BIS minister Matthew Hancock and his pals in the press. However, were it a well-founded line of argument, we could expect to see the proportion of successful claims/cases rising towards 100 per cent. And, as set out elsewhere on this blog, the Ministry’s tribunal statistics show it going down, not up, whichever way we measure ‘success’. So, we can dispense with Possible Factor #4. There’s not really anything to say here, other than: Why do we never hear from ministers about the Employer’s Charter, on which David Cameron really did spend hard-working taxpayer’s money in 2011? And … well, that’s it. I really can’t think of any more Possible Factors. But maybe next time the PUSS for Justice leaps to his feet in the House of Commons, he will enlighten us further. Or, assuming he knows how to use a computer and access the interweb thingamajig, he could post a comment on this blog. Meanwhile, in my next post I will examine Mr Vara’s somewhat convoluted assertion that “anyone who does not meet the financial criteria has a waiver and can go to court”.